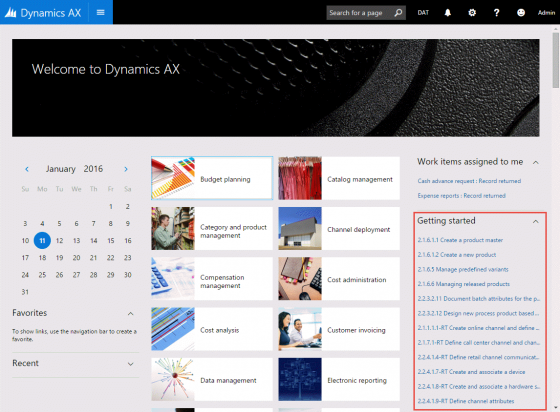 In December 2015, Microsoft released the preview of the new Microsoft Dynamics AX. Partners and customers can now learn what the new cloud based version could bring you. You can deploy a cloud hosted environment from Lifecycle services. When this is complete you can start browsing and learning how to use the cloud based version of Microsoft Dynamics AX. Probably you have already heard about the task guides. There is a way to start your deployed environment in a Trial mode and have dozens of pre-loaded task guides available. This post will tell you how. When you open your Lifecycle services project, you can browse to the Cloud hosted environments. On the details pane you find some links to start AX using several cloud services, but also an option called Login to trial experience. When you click this link, AX will be started, but you also get some additional dialogs. The first one is a question about the industry of your company and your role within the company. When you click next, you can watch a movie what partners think of ‘AX 7’. This is a movie which was already published last year July on YouTube. You probably have seen this already. If not, this is your chance! Now you can use the arrow to continue to the next pages. This is a real nice short summary of user experience changes in Microsoft Dynamics AX. Finally you can click Start to open Microsoft Dynamics AX in the Trial mode. Within this mode a Getting started section will be visible on the default dashboard. This section contains many Task guides to learn using and navigating Microsoft Dynamics AX. These task guides are loaded from Lifecycle Services (LCS). 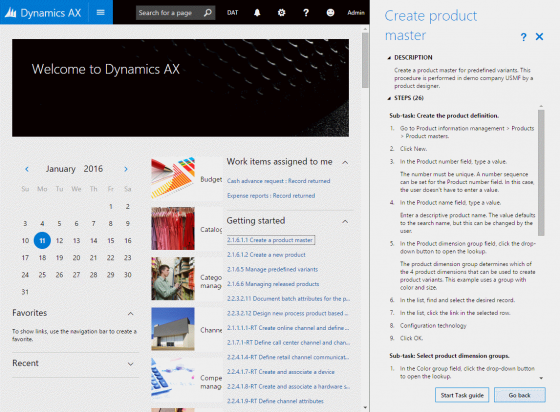 Now you can pick any task guide to open and start the guide to have a guided tour on the new Microsoft Dynamics AX. When you deploy your cloud hosted Dynamics AX environment, you can choose which Business Proces Modeler (BPM) library should be used for the Getting started section. The default is based on the APQC Unified library. 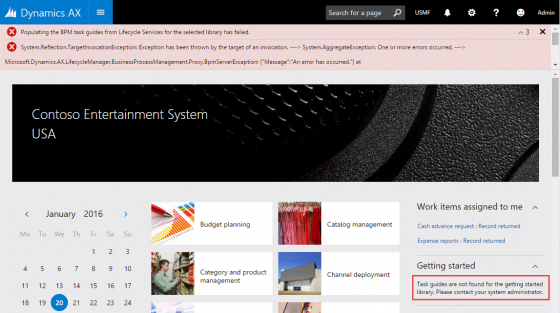 If this one is not selected, you might get an error stating that Dynamics AX cannot find the getting started library. 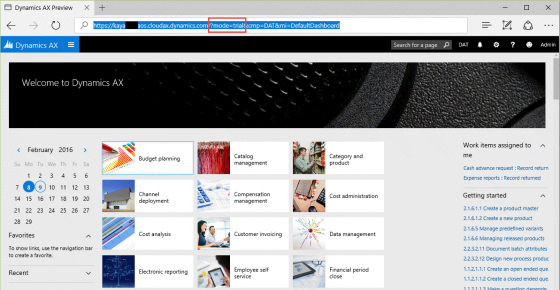 You can also start the trial mode by adding ?mode=trial to the URL for Dynamics AX. This will directly start the Dynamics AX preview with the Getting started section without being prompted with initial dialogs as mentioned above. but I can’t find on my Azure menu Settings including ‘Certificate Management’ (point 8 in the link above). I can’t see on my LCS ‘Login to trial experience’ What I did wrong ? Could you be so kind and suggest something ? The blog you referenced is not related to AX7. So are you now looking at a cloud hosted environment page based on AX 2012? This does not have a trial mode. How to cancel the trial? I am afraid I will we be charged after trial ? Microsoft Dynamics AX7 User Trial for 400 users is seen on admin page of portal.office.com, but I see nowhere to cancel. Thanks. What exact trial are you referring to? If you deployed a demo environment on Azure using LCS, you can be charged. But only if you have a company subscription on Azure. If you used a 30 day trial and did not extend the Azure subscription, it will stop automatically. When you have used an Azure subscription and deployed a VM, you can stop and eventually delete the VM from LCS. After deletion, verify if all Azure resources related to the trial are removed correctly. If you need further assistance, you can create a question on a forum.